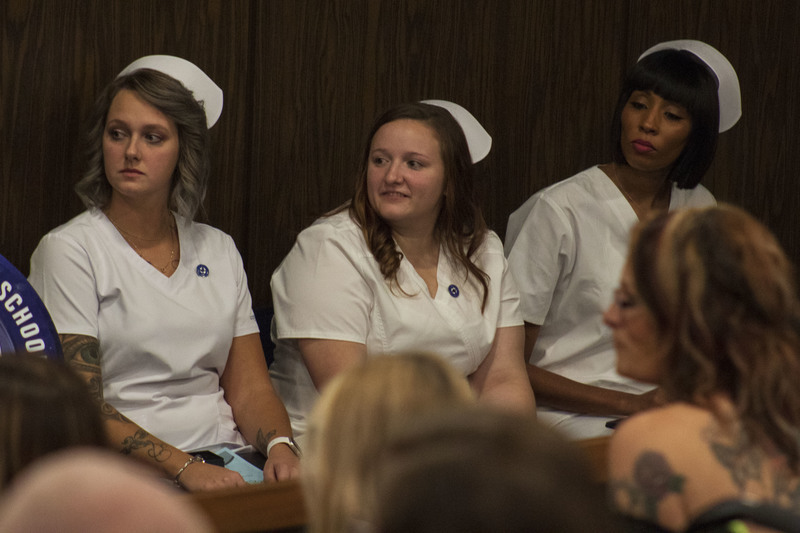 Seven students graduated from The Robert T. White Practical Nursing Program on Thursday, Nov. 1 in the class of 2017-2019. Their next step, passing the NCLEX (National Council Licensing Examination). The seven students have spent countless hours in the classroom, taking part in clinicals and studying to follow their dreams of becoming a nurse. Jessica Ivy Eash, Suzanne Elaine Morris, Since’Ray ReNada Myers, Sasha Nicole Patrick, Holly Anne Salyers, Johnette Nichole Teli and Melinda Ann Zmuda have shown their passion and their dedication to the program over the last two years. Choosing to be an nurse, Mannion explained, takes a special kind of person. The seven graduates choosing this path have shown themselves to be selfless, hardworking individuals who are willing to put other people’s emotional, physical and mental well being above their own everyday. Nurses are constantly thinking about what all the possible outcomes are for their patients in order to figure out the best treatments. The graduates have spent nearly two years learning how to do just that. Morris was chosen to be the class speaker. She addressed both the students and the audience in her emotional speech. Over the last two years, the students became a family. Not only due to the fact that they spent more time together than with their own family, Morris joked. They went through nursing school and experience the stress, the time consuming classes and clinicals and they grew to trust each other. “I truly would like to thank each and everyone of you, because you all pushed me to not give up, and I hope I did the same for each one of you,” Morris told her fellow graduates. 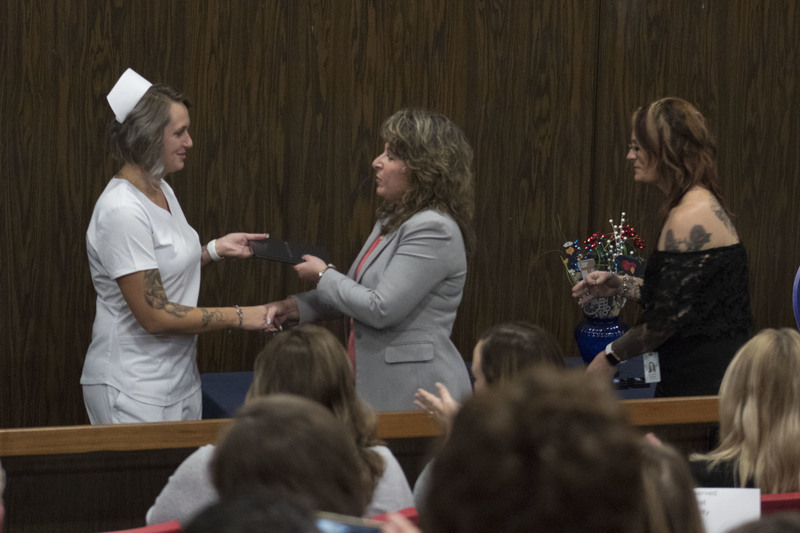 Following the speeches, the certificates were presented to students by the Practical Nursing Program Director, Bonnie Newton RN, MSN. Patrick was presented with a certificate for being the class Valedictorian and Morris and Salyers for being the salutatorians. The awards given to the students were voted on by the nursing faculty. The first award was the Spirit of Nursing award which is given to one student who shows themselves to be a leader in clinical settings and is caring and compassionate. Patrick was presented with this award. The Outstanding Achievement award goes to the student who is considered the most well rounded. Teli received the award. During her time in the program, she only missed 1.75 hours of the total 1,422 hours the program consists of. 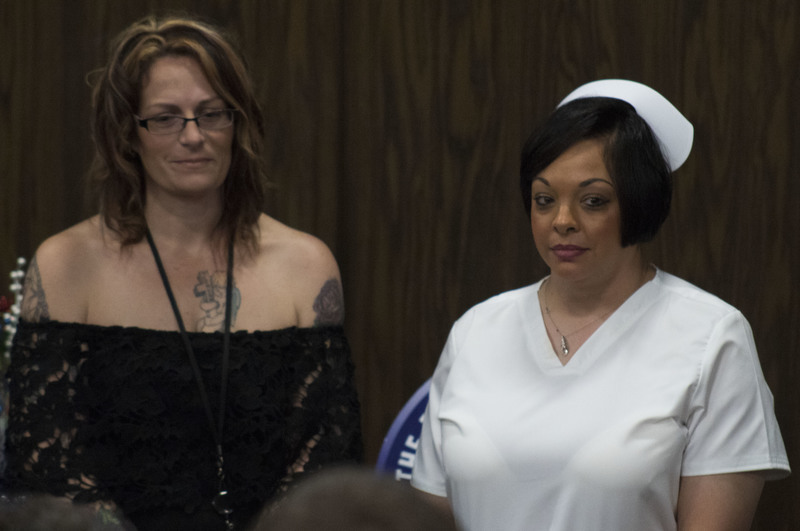 Each of the graduates received a certificate and pin, a major milestone in becoming a nurse. As the valedictorian, Patrick read the Florence Nightingale Pledge.